The present study attempts to highlight the social and economic benefits of leadership of Indian women based on past evidence; current trends; challenges faced and the path forward in the public and corporate arena. Women empowerment has been a vital issue that has come to limelight in the recent years. Despite numerous government schemes and policy decisions, women in India remain deprived of equal opportunities in terms of education, employment and skill development. Many social scientists have derived that economic independence plays a vital role in ensuring that women get equal opportunities in the society and thereby enjoy and benefit from their other rights. This makes women empowerment as much of an economic issue as a social one. In corporate and public life, success of policies is determined by decisions that incorporate the viewpoints of both men and women. Hence, it becomes essential to understand the nature and extent of gender equality especially in public and corporate leadership and decision making roles. The outcomes of this study from these perspectives will serve to help both sectors in narrowing the gender bias in leadership roles. has she not greater courage? Women empowerment refers to boosting women to be self-supporting, obligate positive self-esteem, economically independent, create confidence to face any problematic situation and provoke active participation in various socio-political development endeavours. In corporate and public life, success of service delivery is driven by decisions that integrate the perspectives of both men and women. The extent of under-representation of women in most decision-making bodies is an issue of serious concern considering its overall impact on inclusive growth. History has much evidence to signify the role of women leaders. 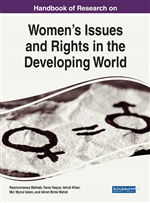 The increased emphasis of this issue by policy makers and international organisations is a sufficient proof for gender equity not occurring as a natural phenomenon even in developed countries (Mason, 2005). Equal leadership of men and women in public and corporate life is inherent not only from the perspective of gender equity and unbiased governance but also ensures inclusive growth of an economy. Hence, it becomes essential to understand gender equality in public and corporate leadership and decision-making roles especially in the context of an emerging economy like India striving towards inclusive growth. The UNDP has made gender equity and women empowerment as the third goal in the Millennium development goals (MDG). Women Empowerment leads to an overall development of the society. Women Empowerment spawns more economic benefits not to the individuals but to the society as well. Women are participating in the national development process by making the nation proud by their outstanding enactments in almost every domain. Women population constitutes around 50% of the world population. Women are equally talented as men. Earlier, women were not permitted for higher education like men and hence their abilities were unexploited. However, presently they are allowed to pursue higher studies and it inspires women to show their talents, which will not only benefit her individually but to the whole world at large. Traditionally, women had four fold status-role sequences as a daughter, wife, housewife (homemaker), and mother. But, modern women are inclined towards social issues, and are trying hard to improve the social status of women at large. Industrialization and technological change have opened vast opportunities of employment for women in different sectors of the national economy. Women’s public/ political empowerment is based on gender equality, right to full development, right to self-representation and self-determination. In India, several measures have been initiated from time to time to provide welfare and representation of women in the constitutional/ institutional frameworks. (Parida & Nayak,2009).These include ensuring voting rights for women as early as 1929, setting up of the committee on the status of women in India in 1971 to ensure increased participation of women in public life. Amendments to the constitution are in place to make 33% reservation for women in representing the houses of parliament.